When I was a kid, I happily got lost in the Hundred Acre Woods. The pages of The House at Pooh Corner were worn from constant reading. I always stopped on the bridge on the walk home from school to play Pooh Sticks. Fast forward about 10 or 12 years, and Star Wars became just as wrapped into my life. So you can imagine how thrilled and touched I was when James Hance started posting images of Wookiee the Chew and Crisolo Robins. The spot on mixture of adorable and nostalgia made me tear up. I wasn’t the only one either. The reaction to the Wookiee the Chew cartoons was overwhelmingly positive. 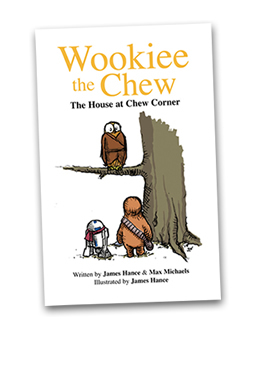 So much so that Hance created a book with Max Michaels titled Wookiee the Chew: The House at Chew Corner. The story features the characters mentioned above as well as Droidlet and Owlbi Wan. Chew sets off one morning with his friend Droidlet in search of bobaberries for soup. The berries are not easy to find though and after counseling from Owlbi Wan, they must head to the dark side of the forest to obtain them. They encounter perils along the way, not the least of which is Chew’s rumbling tummy. The book is filled with one charming touch after another, and you don’t have to be a dedicated, trivia-knowing Star Wars fan to pick up on the many allusions to the saga. If you like both Winnie the Pooh and Star Wars, you can’t lose with this book. The two worlds were made to be merged. I can guarantee that some part of it, probably all of it, will delight you. You can even just flip through the book and look at the cartoons. You’ll smile, you’ll giggle, and you’ll be transported back to your childhood. You’ll want to explore the world around you with a trusty friend. And we can only hope that someone will make a Wookiee the Chew plush toy. 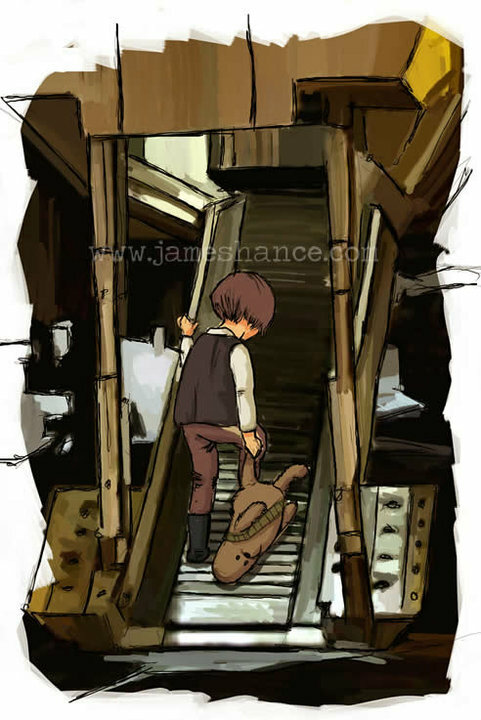 You can purchase the all ages book at Jame Hance’s site; you can also view many prints of Wookiee the Chew and his pals there under the Cartoons section. Thanks so much for sharing Amy! I just purchased the book. Can't wait to read it. Although, I'm getting for my kids as part of their Christmas Presents!